This is an outfit I randomly put together very quickly and everything just seemed to fall into place. Usually my outfits are very planned well before I wear them but today was an exception. 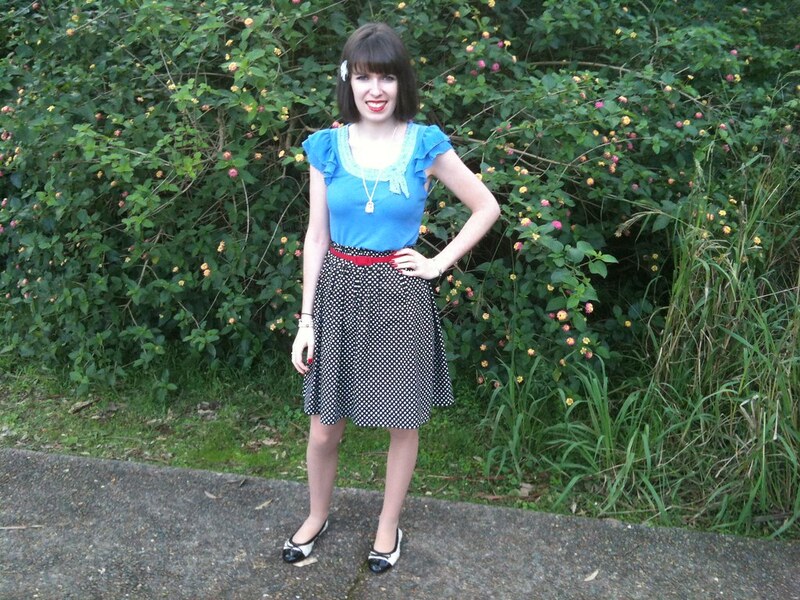 I rediscovered this polka dot skirt that I made a few years ago. I made it long before I started sewing class so it is not as good as the last few that I have posted but I still love it. I don’t know why I don’t wear it more often. 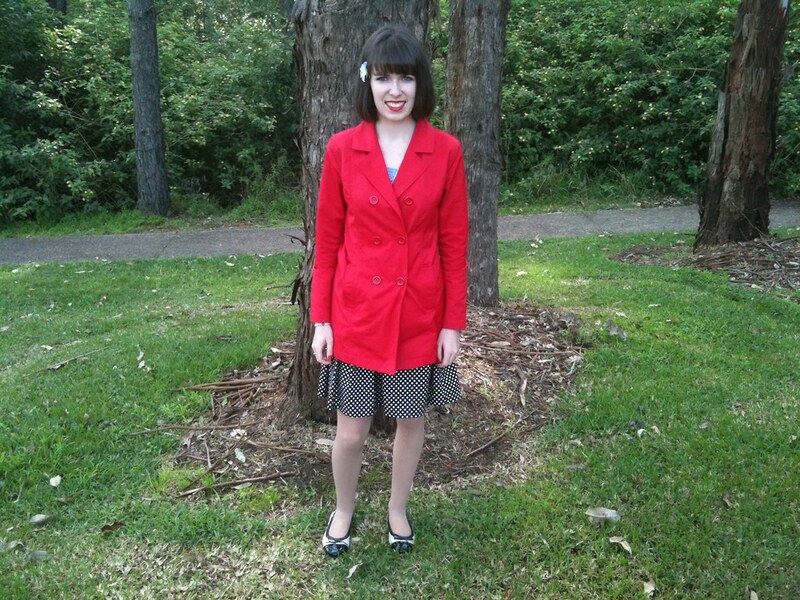 I think the incorporation of red gives this outfit a different look to when I posted it two years ago here. I adore red and blue together at the moment. 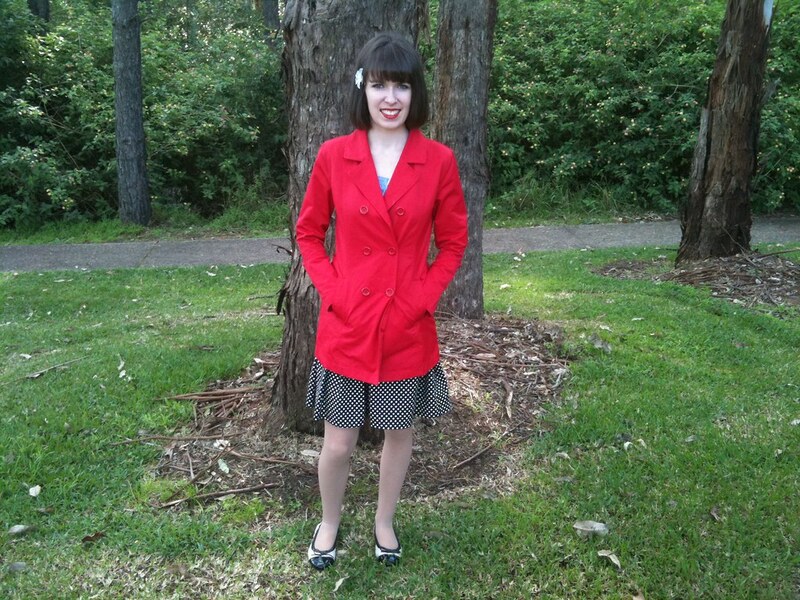 This red trench coat is one of the best items I have ever bought. It is from the kids department and I have seen a few kids wearing it at the same time as me but apart from that it is fantastic. It goes with so many outfits and adds colour. This weekend I am busy completing an assessment for trade practices law. I was extremely worried about it since I am behind in the readings don’t know the content of this subject very well. I am slowly completing it and I can’t wait until Monday when it is all over. This entry was posted in DIY, Outfits, Valleygirl. Bookmark the permalink. Your looking lovely as ever. Dont you just love when an outfit falls together so easily. Im liking your blog changes. How did you do the Home, About Me etc. up the top? Ooo, love that skirt. Polka dots always look so amazing. The red coats looks great with it. Blue looks so good on you with those eyes of yours! ps good luck with the assignment…. That skirt is really flattering on you 🙂 I love your red trench! lovely outfit. I LOVE the red blue and polka dots together. This is adorable! 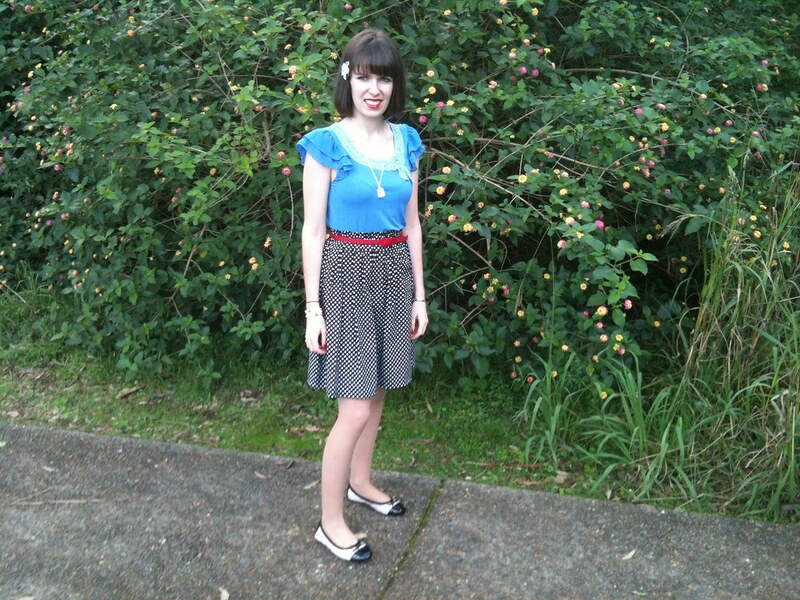 You look so vintagey and cute, and your ballet flats are to die for. You look super cute — love that fun print skirt! That blue top is so pretty! I LOVE that outfit, the colors are gorgeous! Super cute outfit, love your blouse! These colours look lovely on you. A nice red coat like this one will serve you well. Aww I really love your red blazer! so pretty! I love the pops of red on you!! I love the way the red works with the blue underneath. The color combo really pops on you!!!! I love it when outfits just fall into place! 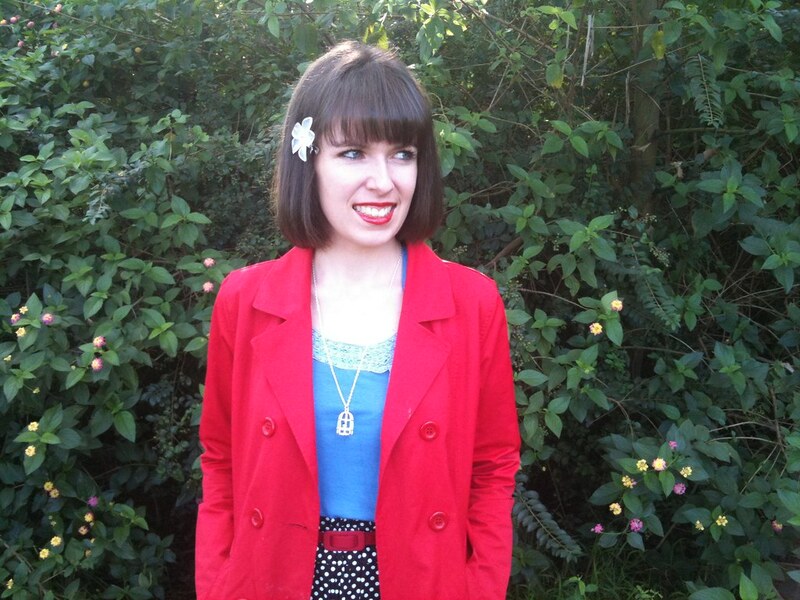 The red jacket is the perfect touch – I love the sudden bright colour! Nice outfit :)! Love your skirt, so beautiful.